Experience ideal lakeside life at City Beach House—located in the highly sought after Fort Grounds neighborhood. Just steps from the Coeur d’Alene City Park and Fort Sherman Playground, this home is truly in a dream location. 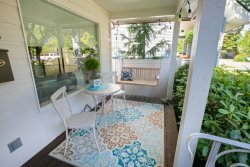 You’ll also be within easy walking distance to miles of public beaches and the heart of downtown Coeur d’Alene. No car is needed when you stay here! The home itself is just as alluring as the prime location. You’ll enjoy upgraded appliances and gorgeous furnishings throughout. With an open concept floor plan, a cozy living room complete with a fireplace, large sectional couch and TV seamlessly flows into the dining area and kitchen. A large wooden table offers seating for 6 and the adjacent upgraded kitchen includes a large granite island with additional seating. On the main floor, you’ll find a master bedroom with a king bed and attached bathroom plus two other bedrooms with queen beds and a separate full bathroom. Another bedroom with a queen bed and ensuite is located upstairs and a studio behind the garage is equipped with a 3/4 bathroom, 2 twin beds, and a twin bunk bed for an additional sleeping for 4. A private fenced backyard with a BBQ and comfortable outdoor seating creates an ideal area to enjoy your morning coffee in the sun or sit under the stars at night. When you’re ready to take advantage of the incredible location, the options are endless. The downtown Coeur d’Alene area includes parks with playground equipment, large grassy lawns for throwing a football or freebie and volleyball nets, all less than 2 blocks from this home. Miles of public beaches, a dog park, Tubbs Hill (suitable for a wide range of athletic abilities), shopping for all ages, a variety of fantastic dining options, and more! You couldn’t ask for a better location to experience all that Coeur d’Alene has to offer with ease! The responsiveness was what really stood out-always heard back quickly. Questions about completion of reservation were answered promptly. A family member with children got equipment they needed for the trip.